4 bedroom/4 bath, recently rebuilt/remodeled. Gulf across the street and Little Lagoon in back, all new interior with comfortable living in mind, decks on 3 sides, approximately 6 miles down West Beach Blvd. away from the traffic and crowds. 2 bedroom with king beds, 2 bedrooms each with 2 twin beds, full size sleeper sofa in living area. This house has a very large living area - kitchen, dining area, living area and sunroom are all open space. The sunroom looks directly out over the sandy beach of the lagoon. Imagine being able to sit at the bar between the kitchen and dining area and being able to see the gulf out the french doors to the front deck and the lagoon through the sunroom windows. Extra large windows and water views from all rooms. There is plenty of parking available under the house and within the turn around areas of the driveway. Paved and shaded space under the house along with an authentic tiki bar for parties. This property is AWESOME! My family vacations in OB and Gulf Shores every year and this home is our new favorite. It has plenty of room, views, amenities, and the location is perfect for families. We loved the easy access to both beach and bay and the low key atmosphere you can only get a few miles out of town. The only negative I have is an inconvenience we had upon arriving. HOWEVER, the owner worked hard at getting it resolved quickly and compensating us for our trouble. We look forward to vacationing here again and highly recommend it! Great place to stay. Clean and comfortable. We will be back. I'm so glad you enjoyed it as much as our family! We are already getting reservations for next year so check your schedule and let me know what works for you. we are so pleased you want to come back! This property was everything that was advertised! Four lovely bedrooms and four private baths. The great room was spectacular; and the wrap around decking gave everyone a true "room with a view"! The kitchen was stocked with everything anyone could ask for and more. The second refrigerator kept us in ice the whole time. Our only disappointment came Sunday night. We had decided to eat in, clean up any food we had brought and run the dishwasher as requested. Unfortunately, at 10:45p.m. on Sunday evening, we had a real mess. We loaded and started the dishwasher and we had water all over the kitchen floor. Oh well, too late to call anyone, so we just unloaded it, washed the dishes by hand as we had been doing and cleaned up the mess. We did leave a note and hopefully a plumber will be called as it may have just been a clogged drain. Would we go back....ABSOLUTELY! This is the perfect spot.!!! THANK YOU FOR SHARING YOUR LOVELY BEACH HOME! I'm so sorry for the problem with the dishwasher! I had it repaired when I was down earlier, but apparently I may need to get a new one. Thanks for letting me know. It will be taken care of! We picked this house because of the great reviews from others and location. Definitely lived up to all of our expectations. It was perfect being right on the Lagoon and the beach being directly across the street. You could sit on the porch anywhere around the house and see water and hear the ocean. Such a relaxing time we had. It was our first time in Gulf Shores, but definitely will not be our last. Thanks so much for sharing your home with us! Great location for family vacations! We thoroughly enjoyed our stay at Samiskit. 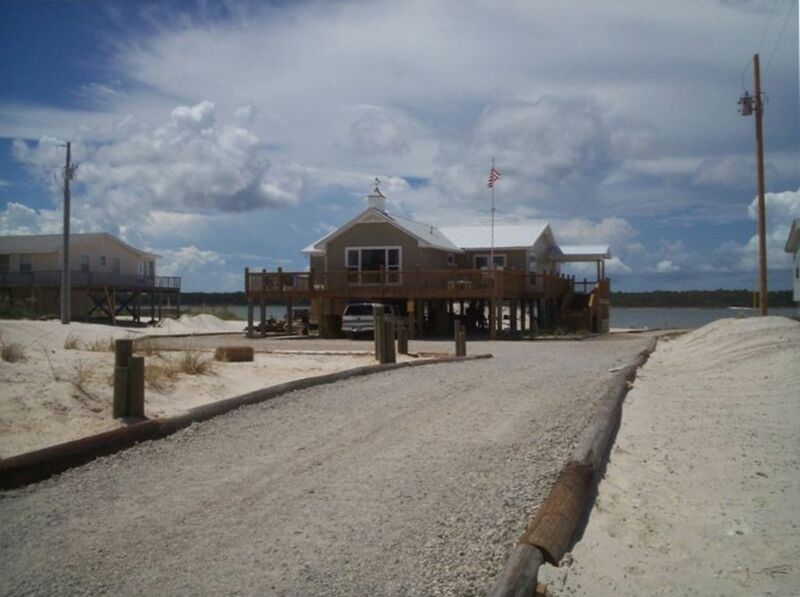 We love the location and look forward to many more vacations in your beautiful beach home. Thank you so much for your hospitality.